Autograph rose to prominence as an opening act for Van Halen on their 1984 tour, an act of distinction for an unsigned band. Autograph was signed to a deal with RCA Records following a performance at Madison Square Garden in New York City in 1984. The band’s debut album, Sign in Please, was completed and released in October of that year, but did not make any impact on the record charts until January of 1985. This album contained the band’s only major hit and signature song, “Turn Up the Radio”. The song became a top-30 hit, pushing the album sales of Sign In Please past the gold mark (500,000 copies sold), and later the album went platinum. “Turn Up The Radio” was featured on a Miami Vice episode “Little Prince”. A second album, That’s the Stuff, saw its release in 1985, and the group went on tour in support of bands such as Motley Crue and Heart. The record was a disappointment (Peaking at #92 in the Billboard album charts), but the record still achieved gold status, supported by the single, “Blondes in Black Cars”. The band remained at RCA to record a third record, Loud and Clear, which was released in 1987, the same year the band made a cameo in the Dudley Moore, Kirk Cameron movie Like Father Like Son about a father and son switching bodies. The first song featured briefly was “Dance all Night” which played briefly, the song they were performing was “She Never Looked That Good for Me” from the album Loud and Clear. Due to poor support from the label (RCA), the album was not a big success. The band left the label and and began recording a new album from 1988 to 1989, which they hoped to release by spring, 1990. Recordings for this album would later surface on the Missing Pieces album (see below). The band would eventually find a new deal with Epic, but it fell through at the last minute, and the members called it quits soon after. Frontman Steve Plunkett recorded a solo album shortly after the breakup that eventually saw release in 1991, while drummer Keni Richards went on to work with Dirty White Boy. Keyboardist Steve Isham joined up with Gary Moon, the future replacement for Jack Blades in Night Ranger to form The Pack, and he later went on to tour with Vince Neil during his solo era. Lead guitarist Steve Lynch formed another band, Network 23. 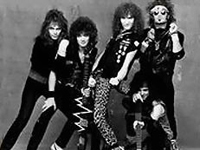 Though the band had disbanded, a few of their music videos from all three albums, most commonly “Turn Up the Radio” from their debut, continued to be played on channels and programs such as MTV and Headbangers Ball for a few years afterward. As that genre of music was still widely popular, every now and then a video from the first two albums “Sign in Please” and “That’s the Stuff” would appear on MTV, while videos from the then more modern “Loud and Clear” appeared frequently on Headbangers Ball between 1988 and 1990. However, with the explosion of Grunge around 1991-92, older videos in the pop metal/glam metal genre were neglected altogether in favor of the newer style of rock music. Thanks to the recent advent of channels such as VH1 Classic, several classic Autograph music videos can once again be seen on television today. In 1997, Steve Plunkett released an album of previously unreleased Autograph material from 1988 and 1989 titled Missing Pieces, along with the unreleased material, a demo version of “Turn Up the Radio” recorded in 1984 prior to their debut was also included in the CD. This CD was well received by fans. Plunkett would resurrect the name Autograph with a new lineup in 2002, and the group would release a new album, Buzz, the following spring. Plunkett went on to produce several artists throughout the 1990′s. He also wrote and performed the theme song for the television series 7th Heaven. Original Lead guitarist Steve Lynch has now been a guitar teacher for a while, schooling students in his virtuosic signature 8-finger “hammer-on” guitar technique. He has also published several books on his guitar style. Bassist Randy Rand began a career in leathermaking, establishing a shop that sells his own hand-crafted leather products and even working with Harley Davidson for a time. According to Autograph’s now-defunct “Turn Up the Web!” website, one of his daughters, Sterling Knight, has become a relatively well-known model in Italy. Drummer Keni Richards later left the music business as well, and has been pursuing his passion for art. “Turn Up the Radio” appeared in the 2002 videogame Grand Theft Auto: Vice City (and “All I’m Gonna Take” in 2006 Grand Theft Auto: Vice City Stories), playing on rock station V-Rock.